My own latest couple of posts have been fairly disparate in their inspiration – last week I wrote about Creative Copying – the way that channeling influences creatively can be a vital part in us learning the craft of what we do, and circumventing the ruts we get stuck in. Then today I added a post about The Joy Of Fragmentation – contrasting old media broadcast models for the arts and media (whether that’s releasing records, writing newspapers or telling a story) and the new model that involves breaking things up into chunks that can be discussed and shared. So for me, whether it’s comments on the blog (every one of which I treasure – it’s always so good to hear from you lovely readers) or people sharing links to my tunes on last.fm or reverbnation, I benefit greatly and cherish the discussion around what I put out. Tuesday night gig in London: don't miss it! 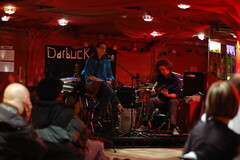 OK, this is VERY last minute news of a gig tomorrow night at Darbucka! It’s a celebration, which you’ll know all about if you’ve been following Twitter over the weekend, and we’d love for you to be there – So much so that it’s only £3 for you to get in if you say you read about it on the blog when you ge there… Normal tickets are £6. So bring your friends and come on down. The gig is at Darbucka, on St John’s Street in Clerkenwell, doors are at 7, music starts around 8 and it’s wise to plan to eat there as the food is amazing, either in the restaurant upstairs, or downstairs in the venue. It’s all marvellous. For more info, if you’re on Facebook, you can check out the facebook event page.